Several people have contacted my office with concerns about media reports that the Department of Homeland Security (DHS) is purchasing large quantities of ammunition rounds-- some have even said the number purchased is in the billions. 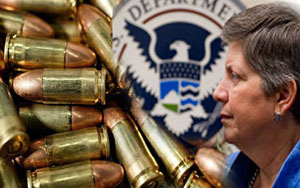 DHS claims that purchasing ammunition in bulk quantities helps ensure the lowest price possible and save taxpayer dollars. Last year, DHS trained nearly 70,000 law enforcement agents at its training centers and used approximately 20 million rounds of ammunition in the course of that training. According to DHS’ latest inventory audit, it currently has 263.7 million rounds of ammunition on hand – slightly more than the number purchased in FY2010 and FY2011 combined. The combined sub-agencies of DHS purchased 148 million rounds of ammunition in fiscal year 2010, 108 million in FY 2011, and 103 million in FY 2012. The DHS agencies that purchased the most ammunition are: CBP, ICE, the U.S. Coast Guard, the Federal Law Enforcement Training Center, and the U.S. Secret Service. DHS is purchasing “hollow point” ammunition because it is the standard issue for law enforcement. According to DHS, hollow point is preferred ammunition for officers throughout the country because it stops when it hits something – rather than passing through for potential collateral damage. I intend to closely monitor this situation about the DHS and other agency as a watchdog on the Oversight an Government Reform Committee. 263 million rounds on hand. 20 million rounds, about 285 rounds per officer, used in training. Less than 10% of the ammo on hand used for training. That means they still have 243 million rounds of ammo available. And they need more? Who are they planning on invading? Hollow points are the preferred ammunition because they inflict greater damage to the human body. Concerns about over-penetration have nothing to do with it. They cost three to five times as much as conventional "ball" ammo which is more typically used for training. It's interesting to note that hollow point ammo is BANNED by the Geneva Convention for use in warfare. I've heard stories like this: http://piccoloshash.blogspot.co.at/2013/03/the-other-day-at-range-i-saw-... Due to gun sales through the roof and lots of non-shooters suddenly starting, the shelves are pretty empty. I doubt the DHS has anything to do with it, because, from what I hear it goes across all calibers. I've even heard of .22LR shortages.